The IOU-NA program is designed for Native American students to participate in hands-on research opportunities at the University of Arizona in optics and photonics, as well as in hydrology, astronomy, soil sciences, atmospheric sciences, environmental sciences, and more. IOU-NA students participate in Native American focused workshops facilitated by the Center for Integrated Access Networks (CIAN) staff. This summer twelve students from across the country came together, performed, and presented unique and innovative research projects. Over the last four years, the IOU-NA program has hosted 35 NA students from 12 different tribes, 17 different universities, and many were freshmen and sophomores. Thirteen students have since graduated and eleven students have gone on to pursue higher degrees of education including degrees from the University of Arizona, MIT, University of Virginia, and more. Since the program has begun CIAN’s IOU-NA REU program will continue for two more years based on National Science Foundation Funding. This year’s students are listed below along with their project titles and mentors. If you would like to learn more or apply for the program visit our website here. 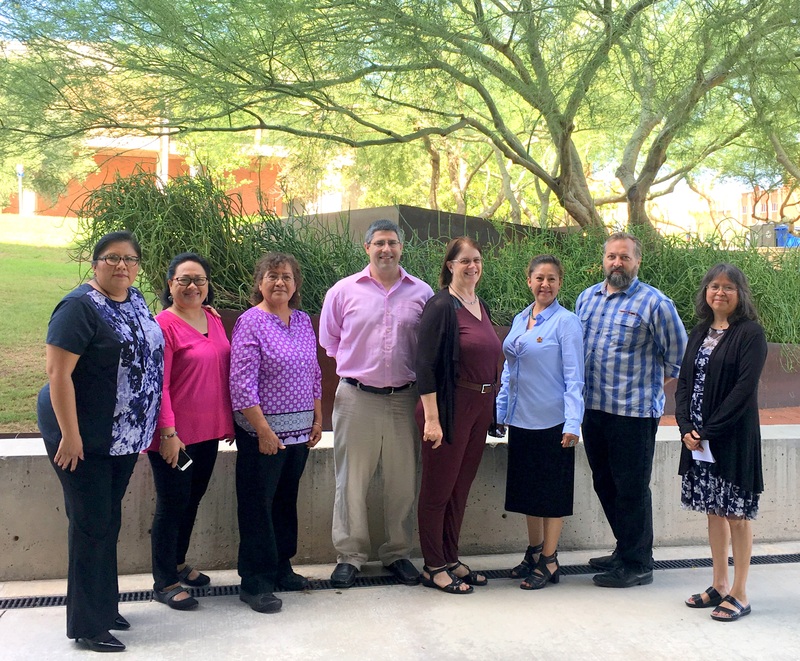 In its second year of grant funding (7th year for CIAN’s Native American focused Research Experience for Teachers programs) CIAN hosted eight educators of Native American students. These teachers participated in an 8-week summer program at the University of Arizona. This included multiple relevant workshops, a course in the College of Education through the Teachers in Industry program, an intensive research laboratory experience, and a unique industry experience at CIAN’s partner companies (Edmund Optics, Lam Optics, and the UA Tech Park). CIAN would like to especially thank the many faculty and graduate student mentors who made this summer such a success. Additionally, CIAN gives special thanks to the industry partners hosting teachers throughout this summer. If you are interested in learning more about the O-RETiNAS RET program or applying, please visit our website. Additionally, if you are interested in hosting teachers as an industry partner or helping in other ways as an industry partner, please contact us. San Simon Family STEM Night Success! As part of the AISPIRE (American Indian Student-Parent Involved Research Experience) after school program collaboration with San Simon Day School on the Tohono O’odham Reservation, CIAN recently co-hosted a special San Simon Family STEM Night. On May 2nd CIAN, WiO (Women in Optics), SOCk (Student Optics Chapter), and College of Optical Sciences students and staff visited San Simon Day School on the Tohono O’odham Reservation to celebrate the inaugural San Simon STEM Family Night. The event was hugely successful with Tohono O’odham students and parents in attendance. Students presented their science fair projects, a number of which were featured and received awards at SARSEF. University participants presented optical demonstrations including virtual reality glasses, a laser radio transmitter, and much more. There was also a rocket launch demonstration by the students and a tribal dance celebrating the students and parents’ culture. Click the picture to see it larger! Overall, the event was a huge success and will be occurring annually in May. CIAN will continue to co-host and participate in the event as part of CIAN’s AISPIRE After School program. The school and the optics volunteers were thrilled to see the event featured on the first page of “The Runner,” the official newspaper covering the Tohono O’odham Nation. This event is largely in thanks to the dedication and hard work of previous ROKET (Research in Optics for K-14 Educators and Teachers) participant, Martha Rogers; and San Simon Principal, Frank Rogers. Additional thanks go to the student volunteers from WiO and SOCk, and all the participants at San Simon. Gilles graduated from ESIEE (Ecole Supérieure D’Ingénieurs en Electronique et Electrotechnique), Paris, France in 1991. 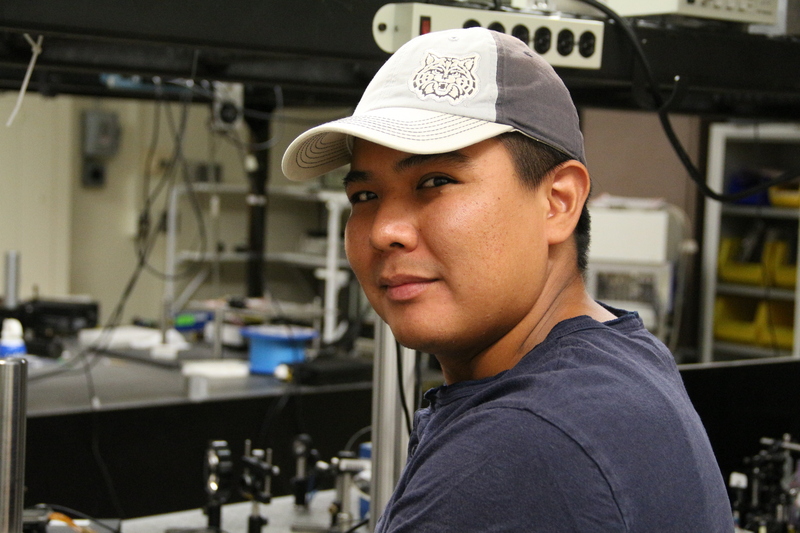 He joined Cadence during his last year of study to work on his thesis (1989). He holds an Engineering Degree with a double major (Signal processing and component modeling). After working in the field (including 8+ years in Japan and 2+ years in Russia), with customers in the areas of analog, Mixed-signal designs and custom layout, he joined the R&D team in San Jose. He lead the migration of the Virtuoso platform to the industry standard database (OpenAccess). 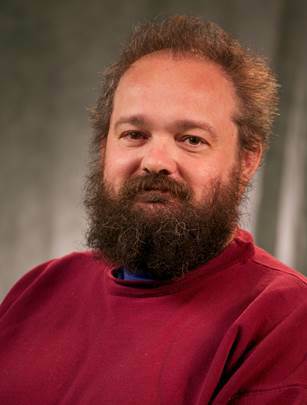 He was instrumental in enabling the FinFet flow in the Virtuoso advanced node platform. About 4 years ago, he engaged into following the photonics industry, and in the last 2 years, lead the Virtuoso development and integration with Virtuoso two main partners, Lumerical and PhoeniX. Looking forward at the next disturbance in the force is his job. He is currently learning about spin-tropics, spin-wave devices. Gilles has about 20 patents, several as a single author. Gilles hobbies include Lego, Pottery and doing things with my 2 twin boys (~6 yo). The close integration of photonics ICs with their electrical counterpart has highlighted for many large companies the big gap in design methodology/productivity/predictability between the two. This has triggered an attempt to leverage the EDA investment (technical and methodology) to ramp up photonics IC design. This is very similar to what has happen on the manufacturing side, with Silicon Photonics taking advantages of all the advances made in CMOS manufacturing. We will review several key examples of EDA methodologies (such as schematic driven layout) that can be used and leverage to increase photonics design productivity. At the same time, we will highlight some differences between the two domains, and how these are dealt with in a production environment such as Virtuoso. Finally we will present some highlights of what can further be done to leverage the 3D, 2.5D IC methodology, signal integrity capabilities and packaging features of the electronics tools as the EPDA solution matures. The recent OIDA/CIAN Workshop sponsored by IPIC and Go!Foton on March 19th, in Los Angeles, CA was a success! The workshop was targeted at companies and innovators considering or already investing in integrated photonics to meet their future product requirements, and who need to understand key manufacturing challenges and how they can be addressed. Read more about the conference. What supply chain, manufacturing, and packaging challenges are common across applications? What common or standardized elements exist across applications? What resources are available and how can gaps be filled? Also during the conference a poster judging competition took place. Three top posters were selected as winners. Silicon photonic waveguides are typically designed to operate with the fundamental mode due to low cross talk with higher order modes and low propagation loss. However, currently, silicon photonics is being exploited for operation with higher order modes propagation for mode-division multiplexing (MDM). This approach utilizes the orthogonal modes of a waveguide by encoding information both in space and wavelength to augment bandwidth limited wavelength-division multiplexing (WDM) systems. Conventionally, ring resonators and grating structures are applied to achieve spatial modes conversion. 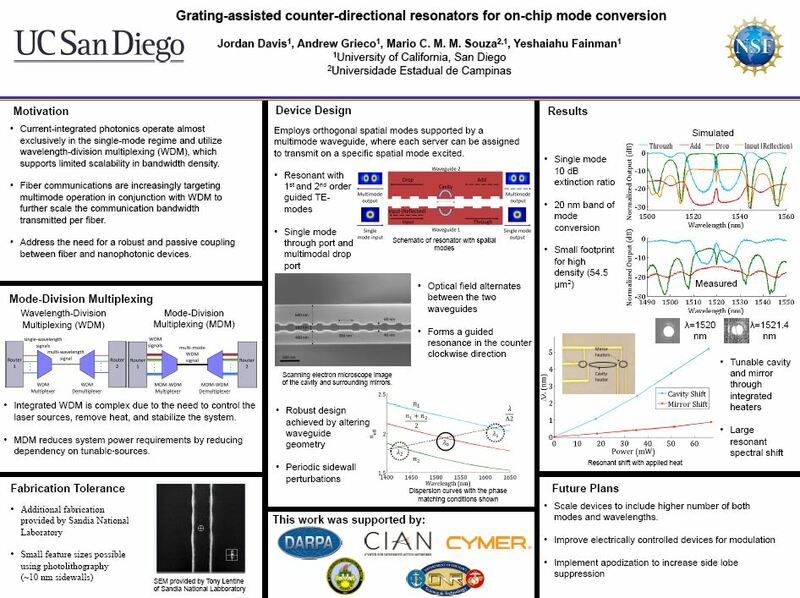 In this paper, we explore an alternative approach to mode conversion using counter-directional resonators. We introduce a cavity into grating-assisted directional couplers, offering both flexibility in design and wavelength selectivity provided by resonant structures. Our compact (54.5 μm2) device is demonstrated experimentally to operate with resonant 1st and 2nd order guided TE-modes. OIDA was a chance for me to visualize the hurdles that photonic startups are meeting. I learned about the opportunities that exist to bring a product to market and the prices associated with these products. 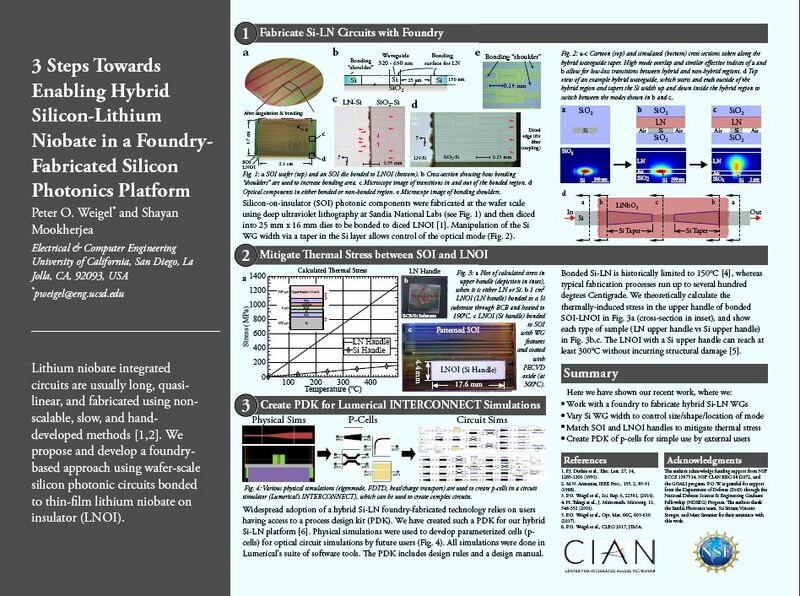 This research focuses on bringing lithium niobate films-on-insulator (LNOI) to the foundry-fabricated silicon-on-insulator (SOI) platform. This is done by fabricating bonded SOI-LNOI integrated devices, mitigating thermal stresses in the bonded stack to allow for standard fabrication procedures, and creating a fully functioning PDK of hybrid Si-LN optical device components for third party users. This technology enables compact devices in LN and highly efficient nonlinear optical devices based in Si, both of which are unattainable with each standalone bulk material platform. The OIDA workshop at OFC 2017 was an exceptional opportunity to hear of the different routes researchers in academia and industry are currently taking to grow integrated photonics from a low-production, manually-intensive industry into something akin to the booming industry that integrated electronics has been for the last five decades. I left the workshop with a feeling of profound fortune to have the chance to work in a field with such impressive men and women. 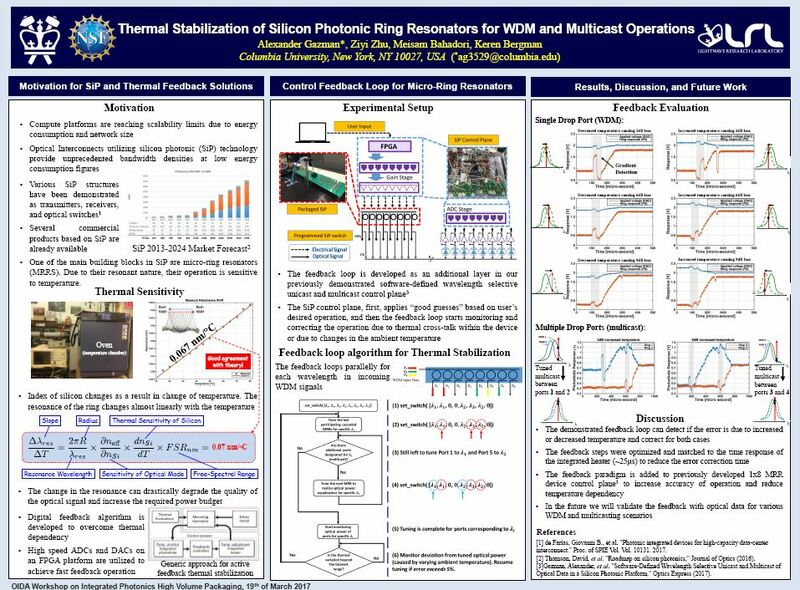 This research is focused on developing silicon photonic subsystems for high-performance computers and data-center applications. 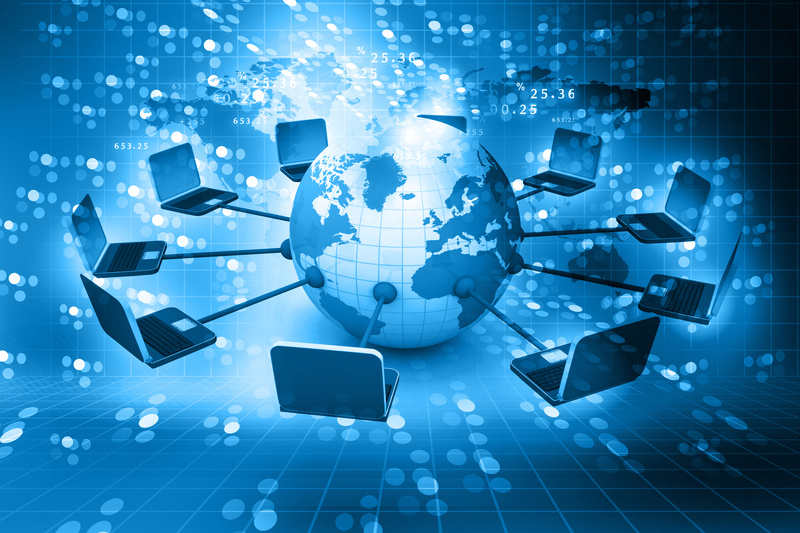 To be able to integrate the silicon photonic technology and utilize its functionality, software-defined control planes ought to reconfigure their operation based on the network needs. Previously we developed a subsystem consisting of a fast tunable laser and a silicon photonic chip operating as a demultiplexer. The demonstrated FPGA-based controlled plane allowed the user to choose a desired wavelength of operation and spatial switching: unicast, multicast or broadcast. In the presented work at the OIDA we added another layer of a feedback control ensure thermal stability of our subsystem. The industry speakers broaden my view on their take on the silicon photonic technology. Additional applications were presented along with commercialization challenges. This poster session was made possible by a grant from the National Science Foundation. ENTERPRISE IRELAND invites applicants to its new Marie Sklodowska-Curie cofunded transnational programme that offers an opportunity for experienced researchers to develop their careers in market focused applied research in Ireland’s Technology Centres, with an enterprise secondment (of 6-12 months in an enterprise Ireland client company) during the Fellowship (of 36 months). Covering a wide range of academic and industry areas aligned with Ireland’s Smart Specialisation Strategy, the 15 Technology Centres were established to encourage greater efficiency in the interaction between researchers, industry, and the public sector, in research that promotes economic growth by its direct relevance to industry agendas. Each multidisciplinary Centre offers excellent facilities and equipment for Fellow use: experienced scientific staff to support the Fellow’s research and extensive enterprise relationships on which market focused applied research can be progressed. Career-FIT is a postdoctoral fellowship programme, part-funded by Horizon 2020and part-funded by Enterprise Ireland. A key feature of Career-FIT is the opportunity for an experienced researcher from outside Ireland to develop their careers in market focused applied research through 3-year fellowships with secondment into industry through Ireland’s Technology Centres. Successful candidates will carry out research in Ireland and will gain inter-sectoral and interdisciplinary exposure thorough this programme. Experienced researchers are defined as those who are in possession of a doctoral degree or have at least four years of full-time equivalent research experience. There will be two calls under the Career-FIT programme. The first call has an application deadline of 31 March 2017. The second call will open in 2018. There will be 25 fellowships awarded in each call. For more details and contact information see here. This year’s Student Retreat and Innovation to Market Workshop took place in San Francisco, CA. Students from across the CIAN universities attended to participate in the professional development and innovation workshops. Two speakers gave workshops for the students. Below is included the recording of Will Tungpagasit’s presentation on Startup Life and Bri McWhorter’s summary of best practices in formal presentations. 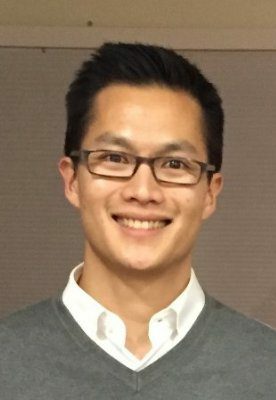 Will Tungpagasit, engineer and entrepreneur, will share his experiences founding and building companies in Silicon Valley. He will clarify the hype surrounding the industry, what options you have to actually building a company, and specific strategies on how to innovate efficiently via entrepreneurship. Afterwards, he’ll lead a brainstorming session and meditation workshop. 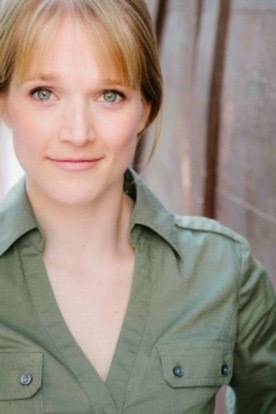 Using acting tools, learn the techniques that all the best public speakers utilize to craft a dynamic and compelling speech. Become familiar with the necessary vocal, articulation and breath support tools that every presenter should have. Figure out how to distill your message to clearly articulate your ideas and take advantage of every opportunity which comes your way. Explore what makes you unique, clarify your career goals and make a plan to develop your personal brand. No matter where you are presenting your ideas, whether it is in a formal presentation, an elevator pitch or developing your brand, you need to think about your audience first. How you craft and deliver your message depends on who you are speaking to. Think about what type of audience you will be addressing. Are they a technical audience or a general one? What type of jargon is appropriate? How much detail can you go into? Knowing these answers will help you develop and organize your message. Once you have that message, you have to think about the best way to deliver it. Focus on telling your story, rather than reiterating facts. Tell the audience why they should care about your research. Get them invested in the process. In an elevator pitch, you have a very small window of time where you have to capture your audience’s attention. Have a few pitches ready depending on whom you are talking to. That way, once you know a bit about their background, you can jump into the pitch that best fits the situation. However, it isn’t enough to have different ideas of pitches, you need to workshop them. Practice with people from different backgrounds. See what works and what doesn’t. Then adjust your message depending on that feedback. It would be a shame to miss an opportunity to connect with someone because you didn’t take the time to work on perfecting your pitches. Knowing who your target audience is will help you decide which social media platforms to utilize. There are so many options available and it can be a bit overwhelming when you are starting out. For example, if you are trying to target young millennials, Snapchat is a good place to start. However, if you are trying to reach experts in your industry, I would suggest utilizing LinkedIn first, so you can establish a larger professional network. Once you decide who you want to target, start connecting with people. Engage with posts they’ve written. Share your own ideas by writing articles. Establish your voice and take advantage of every networking opportunity that social media provides. During a presentation, a pitch, or building your brand, always think about your audience first. Craft your goal by thinking about things from their perspective. This will help you create, distil and deliver your message in the most effective way.